Yves here. This post originally had the title, Intergenerational mobility and preferences for redistribution, but as you will see, it is mainly about America. The state by state breakdowns of actual versus perceived odds of rising economically is revealing. The tidbit at the end, reactions to factual information, is more predictable based on other experiments with people with pre-existing beliefs. Americans are generally thought to view the economic system as fair and see wealth as a reward for ability and effort, while Europeans tend to believe that the economic system is unfair, and that wealth is the result of circumstances. This column tests this using new evidence on beliefs about intergenerational mobility in four European countries and the US, and confirms that Europeans do indeed tend to be overly pessimistic about moving up the social ladder compared to reality, while Americans are overly optimistic. 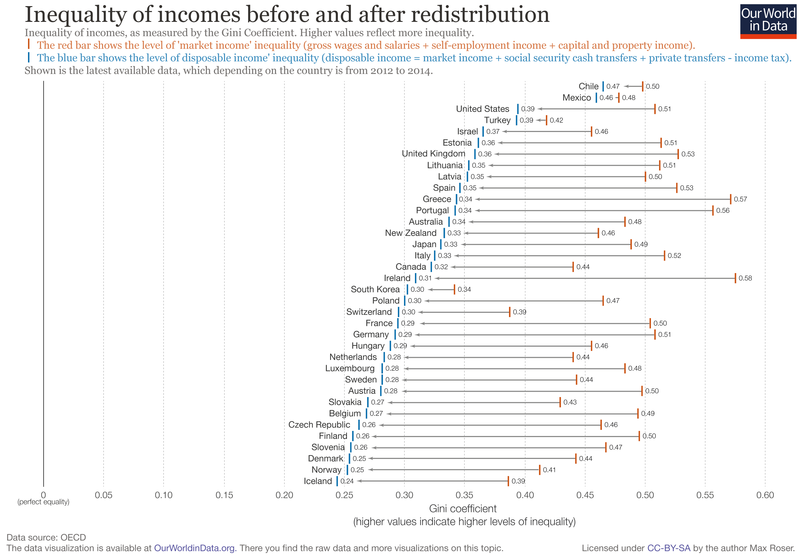 These perceptions have important implications for how redistribution and equal opportunity policies will be received. John Steinbeck conjectured in 1966 that there is not much support for redistribution in America because the working poor saw themselves as “temporarily embarrassed millionaires” (Steinbeck 1966). Are people willing to accept high levels of inequality if they think that everyone has a shot at climbing the social ladder? Is tolerance for inequality linked to belief in equality of opportunity? These questions are especially relevant today, with sharply increasing inequality in many industrial economies and especially in the US. Whether or not redistribution or equal opportunity policies are supported depends on perceptions of fairness of the market system. The (stereo)typical view on intergenerational mobility distinguishes between ‘American’ and ‘European’ attitudes. Americans are thought to view the market system as relatively fair, and to believe in the ‘American dream’. Thus, they see view wealth as a reward for ability and effort, and poverty as the result of inability to take advantage of opportunities. In contrast, Europeans tend to believe that the economic system is unfair, and that wealth is the result of family history, connections, and sticky social classes. Poverty is the result of bad luck and the inability of society to take care of the needy regardless of their effort (Alesina and Glaser 2004). Today, however, the American dream may be more accurately described by the green light at the end of Daisy’s dock in The Great Gatsby – which Gatsby likes to contemplate and reachs for relentlessly – the embodiment of a “dream” that seems “so close that [we] could hardly fail to grasp it”, that provides Gatsby with profound motivation to work hard and succeed, and yet ends up being out of reach and unattainable. In fact, new data (Chetty et al. 2014) suggest that intergenerational mobility in the US may, in fact, not be higher on average than in Europe, even though within the US there are large geographical differences in intergenerational mobility. In a recent paper, we collect new survey and experimental data for five countries (France, Italy, Sweden, the UK, and the US), to document the anatomy of people’s beliefs about intergenerational mobility and the fairness of their economic system (Alesina et al. 2017). We begin by comparing people’s perceptions of mobility to recent data on actual intergenerational mobility in the five countries. Figure 1 illustrates these results. Panel A shows the average perceived probability of remaining in the bottom quintile against the real probability in each country. Points above the 45-degree line therefore indicate more pessimistic perceptions. Panel B similarly illustrates the probability of moving from the bottom to the top quintile. In this figure, being optimistic about mobility implies being above the 45-degree line. 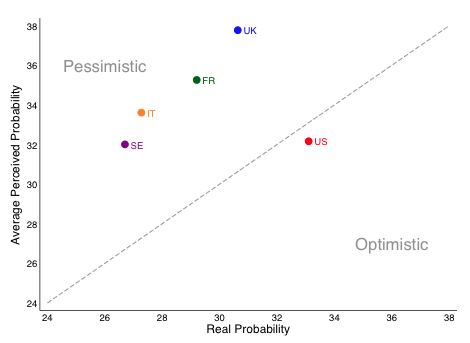 Europeans are not only more pessimistic than Americans, they are also overly pessimistic relative to reality, while Americans are overly optimistic. Americans vastly overestimate the probability of making it to the top of the ladder for children starting from the bottom. This is the embodiment of the idea of the American dream. Europeans are instead overly pessimistic about the chances of getting out of poverty – that is, out of the bottom quintile. 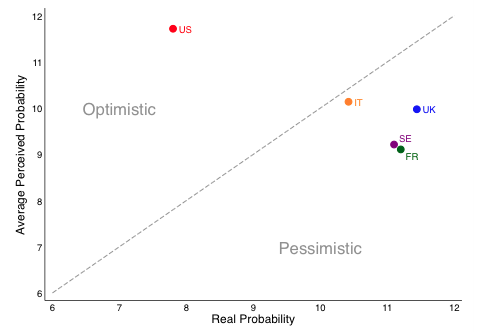 Interestingly, and this is a finding worthy of additional research, we find that Americans are especially overoptimistic about social mobility in parts of the country where actual mobility is especially low (the south and the southeast), and they are pessimistic where mobility is actually high (the north and northwest). This is shown in the three maps of Figure 2. 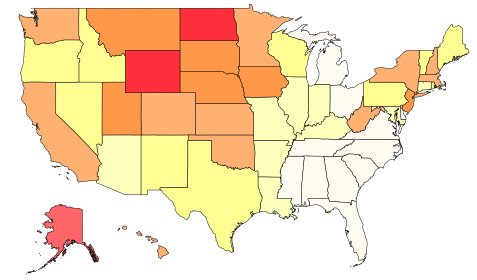 Map A shows the different level of social mobility as measured by Chetty et al. (2014). Map B shows the perceptions of social mobility derived from our data. Even a cursory look at these two maps shows a clear inverse correlation, highlighted in Map C, which shows the ratio of perceived to actual mobility. A majority of Americans tend to believe that the economic system is fair, while French and Italian respondents have extremely negative views about the fairness of the system, and show extraordinarily low levels of trust in the government regarding policies to increase opportunities. Half of US respondents agree that the system is fair, and 53% believe that everyone has a chance of making it. Only 10% and 19% of Italian and French respondents, respectively, agree that the system is basically fair. Similarly, only 13% of Americans say that they never trust the government, in comparison with 29% of Italian and 33% of French respondents. We also uncover deeply polarised views on policy. Left-leaning respondents are pessimistic about social mobility and the more pessimistic they are, the more they see a role for government in implementing equal opportunity policies, like spending more on public health and education, and financing them with more progressive income taxes. In contrast, right-leaning respondents seem to see the government as the problem rather than the solution, and even those who are pessimistic about social mobility do not want more government spending. In the final part of the survey, we performed a randomised experiment. To the treated group, we showed an animation meant to make them more pessimistic about social mobility. The treatment had a strong first stage, and those who saw it had more pessimistic views about social mobility than those who did not see it. It reinforced the polarisation of respondents. Left-wing respondents who saw the animation wanted even more government intervention. Right-wing respondents – even though they were made more pessimistic about social mobility by the animation – did not want the government to do anything to correct the problem. Thus, the treatment had the effect of either ‘preaching to the choir’ or ‘preaching to the deaf.’ Our findings confirm the idea that “the message of the right is increasingly: It’s not your fault that you’re a loser; it’s the government’s fault” (Vance 2016). This entry was posted in Free markets and their discontents, Guest Post, Income disparity, Politics, The destruction of the middle class on June 22, 2017 by Yves Smith. 1. I’m not shocked that your average ‘winger perceives gov’t as the agent behind the current dearth of social mobility in the US. I am the sole lefty in a shop full of ‘wingers and hear every day about how private industry is “da bomb” and how government is hopelessly corrupt and impotent. After I remind them that their vaunted captains of industry largely dictate gov’t policy in this country a la Citizens United, they usually retort with the some Horatio Alger tale about how so and so made it big, those darn liberals ruin everything, whine about how their property taxes are too high, and if we only fired more of those lazy overpaid gov’t workers (or privatized services), we’d all be Horatio Alger protagonists, the trains would run on time, and hallelujah! The private sector is da bomb! I’ve tried a number of different responses to no avail. For example, when I tell them that the gov’t can drop a bomb anywhere on earth within 24 hours (to address perceived gov’t impotence) I get the “but but that’s the military, that’s different” response. Sometimes I wish I could resurrect Eddy Bernays and ask him how to reach ‘wingers because I just don’t get them, especially the “Schwebian Housewife” types. You know, the guys and gals that live in McMansions yet save the ketchup packets in the rare event they order take out who tend to harshly judge others who dare to live it up and purchase a bottle of Heinz. 2. I absolutely LOVE that this article leads with John Steinbeck’s “embarrassed millionaires” quip. There’s a commenter here that absolutely hates that I repeatedly cite this quote day after day and I can’t wait for him/her to read it being cited in the first ‘graph. One of the strategies of the ruling class is to finance social insurance using wage taxes. Every time a worker gets his pay check there are large deductions reminding him everyday that any redistribution comes out of his/her immediate needs. Likewise, the war on drugs and nuisance fines for traffic violations, (witness Fergusen MO) pit the government against its citizens alienating them. Adversarial government regulations likewise alienate. Let’s say OSHA discovers violations of safety regulations at a work site. Instead of punitive fines, grants to improve safety would give a different perception of government. Likewise, with environmental regulations. It is the punitive exercise of government, that creates the perception of government as corrupt. Not that it isn’t, but it is the punitive as opposed to the supportive role of government that becomes a self-fulfilling prophesy. I believe that this is done by design. There’s a big strain of authoritarianism in the US where people want to see the government being punitive — assuming it will only be done to outgroups they don’t like and not them. It’s pretty much the basis of Republican and Trump ideology. Making government objectively ‘better’ doesn’t interest them at all. And making school so tedious, boring, and/or so full of rules that only martyrs persist in going. And that’s without DeVos shoving Jesus in or draining out what’s left of vitality or creativity. Thanks for mentioning Horatio Alger. Many years ago, I read portions of “The Work Ethic in Industrial America”, by Daniel Rodgers, which now appears to have come out in a second edition. Rodgers pointed out that the Algers protagonists almost never started out in factories, which were quite grim in those days. Instead, they were usually farm boys or street urchins selling newspapers to potential merchant patrons. In other words, the Horatio Alger formula is mostly a fantasy. Jon Steinbeck was right 50 years ago. He’s just as right today. I identify on the Left, a social Democrat, or progressive. I’m very pessimistic about my chances of reaching the top quintile, all the more so since I have come close recently. I think the American Dream is a driver of the culture of the hustle and its use as a carrot in front of the donkey of labor keeps the proletariat productively in line. I live in Colorado, close to Wyoming. The chart above is only true in oil boom years, similarly to North Dakota. America’s class system is much more rigid than most Americans believe. Having made an informal study of it over my adult lifetime, I’m very much in agreement with that famous French economist, Thomas Piketty. Perhaps, if democracy and capitalism are in opposition, those parts of the country that are most deluded about their opportunities are also the parts of the country that are least (small d) democratic. On average, Americans as a whole, based on the survey results are deeply delusional. Either brainwashed or just plain delusional like the right wing types who are pessimistic, but oppose government action compared to the rest of the nations in the survey. What’s even more sad is that France has a better intergenerational mobility. As this chart shows, there’s a correlation between inequality and intergenerational mobility. I am also interested in the Deep South and the Southeast as a whole – they seem to be the worst when it comes to perceptions of mobility versus the reality. Could this be why reactionary politics are so strong there? It is also interesting to note that the Eastern to Central Midwest, especially Michigan, is also delusional. I suspect that may be because the full impact of the decline of the automotive industry has not yet sunk in. I’d love to see a breakdown by generation. I suspect that my Generation, Y, has a better understanding of how messed up the situation is, but even then, many Gen Yers will be deluded. Actually, though I made the point in too waffly a way below, it may be that causation runs the other way. Reactionary politics (via a steady diet of just FOX news) can alter the size/distribution of the ‘error terms’ in an individual’s views. Artificially lowering the size will lead to the phenomenon observed of more skewed perceptions. A true, uniform, ‘mildly’ out of step set of views nationally can look hugely out of step in certain regions if the stimuli/exposure/information provided makes Mr X living in the Deep South ‘artificially certain’ of certain views compared to others. Altandmain: I know from talking with some European friends that their analysis of U.S. Southern history is of a feudal state that also was a colony (cotton, especially). So the politics of much of the South have always been reactionary, with the upper classes (the planter class) forcing its views on the white middle class (which struggled to exist) and the working class (black and white, which barely existed because the South remained almost pre-industrial into the 20th century). Don’t forget that for much of Southern history, the largest city, and center of education, would have been New Orleans, the least “Southern” of cities. So the demands made by urban centers would have been ignored. I am also reminded of a statement someone once made about Lincoln: He made a kind of pact with the devil. He kept the United States united. But at what cost? 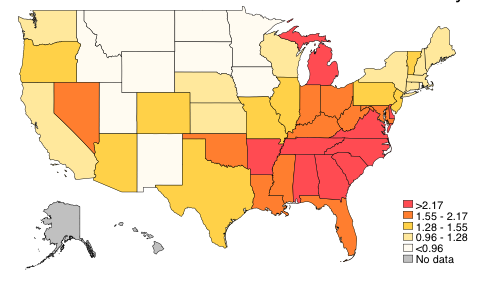 If the South had seceded successfully, we might have ended up with a tier of states from New England to the West Coast that would have had Scandinavian-style laws and levels of prosperity. The seceded South would have ended up something like Mexico–uneven development, to put it politely. I think that it’s unlikely that the US North would have reached Nordic levels. It’s far more likely it would look like a less equal version of Canada and Australia, which unfortunately are under the grip of neoliberalism too. Agree that the US South has been influenced by a very colonial history and that the ruling class has a modern day “plantation” mentality. Does anyone know how immigration rates might affect mobility from the bottom part of the socio-economic strata? I ask because I recall reading a book about tn years back that claimed that a lot of U.S. income equality was due to the fairly large number of immigrants it took in. The idea was that this continuously added to population in the low income range so even though they increased their income over the years after arriving the influx of new immigrants kept the population size of that low income range quite large. If this were true wouldn’t it also have the effect of increasing class mobility and make it look better? I don’t know how upwardly mobile the lowest strata were, but if my memory is correct, post war America experienced a narrowing of inequality until the 1970s. I also looked at the US stats on the percentage of immigrants and found that between the late 1920s and early 1970s, the percentage of foreign born residents in America fell greatly. Their absolute numbers also declined somewhat. My guess is that with fewer immigrants competing for low paying jobs, their bargaining power increased. Whether or not many climbed the ladder, I can’t say, though I imagine in such good economic circumstances it must have helped their chances of moving up, especially as many of these post war European immigrants were educated and/or skilled. I consider this to be unlikely, or at least only a side issue. Compare income inequality before and after taxes and transfers. Before taxes and transfers, the US Gini is not much different from that of Germany and France (nevermind that Germany and France also both have fairly high levels of immigration); but after taxes and transfers, the difference is night and day. Hmm. I’m not saying key results of this paper are necessarily wrong – I don’t have time to go through the econometric model in detail. However, a key word that is missing in the entire original 2017 paper is ‘heterscedasticity’/’heteroskedasticity’ which worries me since some of their regressions involve limited dependent variables (e.g. “basically fair” / “not fair” etc). This phenomenon – differences in the error term which are now increasingly recognised across the more specialised areas of survey sampling (especially within a given individual) – is more problematic when the dependent variable is discrete rather than continuous – basically instead of the ‘minor annoyance’ of the need to correct the standard errors, you get (possibly huge) biases in the actual beta estimates (proved in 1985) and putting in dummy variables like they do is not the solution, and can make the problem worse if an individual has different sized error terms associated with (for instance) their views on government waste vs views on general mobility. Thus, just a pure thought experiment, choice frequencies in one region may be more skewed (closer to 0 and 1) not due to real differences in that region’s true underlying beliefs about how much better/worse things were, but because their error terms are smaller, typically reflecting better education, more knowledge about the wider context of the issue at hand, but conversely can be due to less exposure to other viewpoints/experiences and, in essence, artificial exaggeration of their views – “certain but wrong”. You see the effects comparing, say FOX news viewers with others – ask the questions in a certain context (mentioning things like government) and an absurdly small error term increases your betas and skews predicted probabilities. But when asking about relative priorities out of context (e.g. single payer health care compared to another objective that may be similarly ‘less politically charged and ranted about recently on TV’) and adjust for error differences, you find the much more consistent picture of relative levels of support. It may seem esoteric, but the implications of different interpretations of the data are large: changing underlying attitudes is difficult once people reach a certain age (though a World War does the trick nicely), but changing how important these attitudes are in public policy (and thus to what extent a person may suddenly switch to a party you’d think should be anaethema to them) or introducing more/less uncertainty into particular views an individual holds is routinely done by the media etc. This suggests the more trapped you are in poverty, the lower probability policies will help you because you don’t believe on those. I believe this is true worldwide. EEUU is not exception. “I guess the trouble was that we didn’t have any self-admitted proletarians. Everyone was a temporarily embarrassed capitalist. Maybe the Communists so closely questioned by the investigation committees were a danger to America, but the ones I knew—at least they claimed to be Communists—couldn’t have disrupted a Sunday-school picnic. Besides they were too busy fighting among themselves.” John Steinbeck, “A Primer on the ’30s.” Esquire, June 1960: 85-93. This is often paraphrased as: Socialism never took root in America because the poor see themselves not as an exploited proletariat, but as temporarily embarrassed millionaires. Thanks, JF. It is interesting to see how “quotes” have a life of their own. If 10% have on average 10 times the average net worth, then there is no chance of more people joining the elites unless everyone else on average has negative net worth. So those who insist the government balance the budget and reduce taxes so they can get richer are actually demanding a decrease in the possibility they will ever succeed. Probabilities rule! I think that John Steinbeck’s comment is accurate only if it is understood to be ironically witty or polite. The claim that ” Americans are generally thought to view the economic system as fair and see wealth as a reward for ability and effort, while Europeans tend to believe that the economic system is unfair, and that wealth is the result of circumstances” should itself be questioned by seeing the words ‘generally thought to view” and “tend to believe” as unwittingly ironic. It depends who you ask and how mindful of political economy those ‘whos’ are. It also seems to me important to know what ideas were taught to people, and are still being taught, to explain how we earn our just desserts. Many of us are so misinformed and kept stupid that we can’t properly write cheques or calculate interest costs. We can not or will not learn how to shop comparatively, divide costs by units nor check our receipts. We are prone to believe and repeat whatever we were told early and repeatedly. We perceive that the sun rises in the east and sets in the west, that the solstices and vernal/autumnal equinoxes mark the “first days” of summer, and so on. It’s no wonder that we are so easily gulled, most of us knowing nothing. We’ve also, many of us, been conditioned to present ourselves as potentially successful rather than irredeemably failures for one reason or another. If you remember that Lennie was a simpleton, that many of Steinbeck’s characters were blessedly ignorant and helpless in the wide, wide world, you’ll have a sufficient understanding of why some consider a rigged system fair. Foolish me — I thought we do enjoy a high degree of economic mobility in the U.S. It’s just that the mobility of today seems generally downward. And besides “pure” economic mobility we “enjoy” a lot of literal mobility — moving from one part of the country to another chasing jobs. This literal mobility might impact any statics classified by geographic regions. But I’m not sure in what ways. I can’t imagine how someone in the old South or Rust belt could be so optimistic as the data seem to suggest. What makes a person leave their family, friends and the world they are familiar with? What kind of person makes the move? While we wonder about our place in the economic hierarchy I wonder whether the bottom of that hierarchy isn’t sinking along with the opportunities for our children. So — is it that the middle class shrinking or is it more accurate to suggest the lower tiers are shifting lower and wider while the uppermost tiers grow razor thin in their rise to ever greater heights? I doubt how much tolerance for inequality in the U.S. is because individuals “over-estimate their odds of coming out on top.” I think it may be more closely tied to a general ignorance of just how unequal income and wealth distribution have become. I also suspect the public school system in the U.S. and our entertainment and news industries are more effective in their propaganda efforts — and of course the European systems were infected with a taint of socialism not yet fully eradicated. Those who inherit wealth and land pretend that everyone does. If you work in a service job in private industry or sell a low priced product, you are to be paid like a servant, meaning not enough to invest in yourself or anything else. That Mason Dixon line proffers beliefs that are convenient for employers above it and below it. This is not surprising. I would also say that most Americans seem to overestimate how intelligent and talented they are. It seems that whenever I talk to someone about their job they always claim to be the only person at their workplace who works or knows what they are doing. Everyone else is lazy or dumb or both. You really can’t have a culture of solidarity when so many Americans think they are the greatest thing since sliced bread and that one day they will be rich and that the only thing keeping them down are those damn liberals! Really Yves, Alberto Alesina? Show some good taste and have some mercy on your readers.